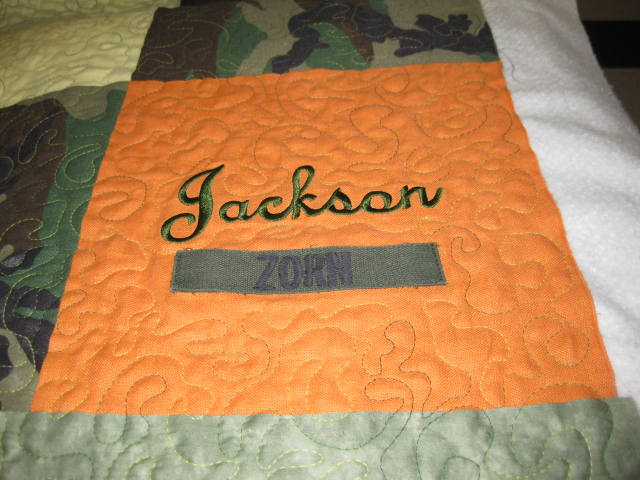 I also specialize in custom quilts. 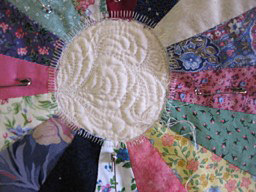 If you have collected vintage embroidery from your mother or grandmother, or if you have pieced a quilt top and want it quilted, I can make your dream quilt a reality. 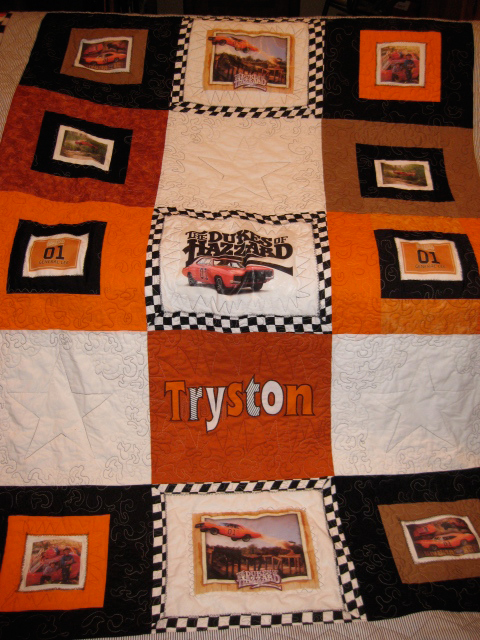 Below are several photos of quilts I have made for my customers. 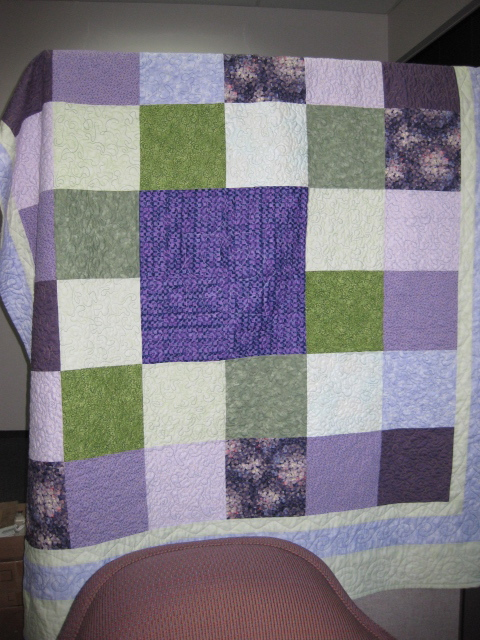 They range from vintage embroidered squares, as seen in the center of the blue quilt featured below (one customer's preference), to shades of lavender and green (another customer's preference). The latter customer gave me "free rein" to interpret whatever style would work best with those colors. 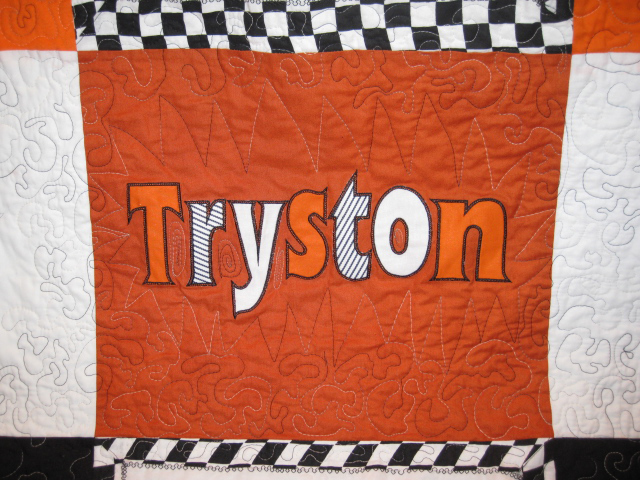 Please remember, without seeing any specific quilt plans, these are ESTIMATED PRICES ONLY. 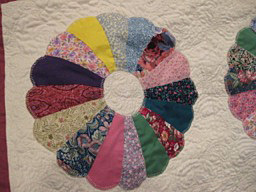 I can also provide materials for your quilt project. 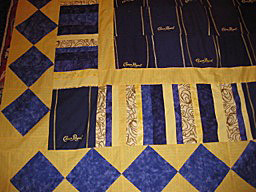 I do prefer to provide my own quilt batting, as I have used the Warm & White brand batting for over 10 years. 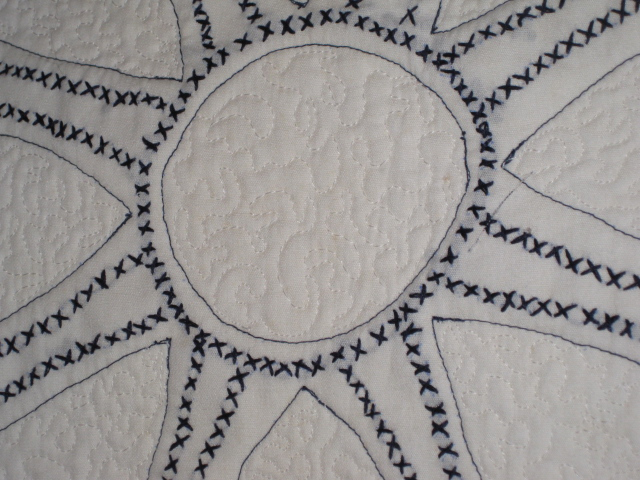 The Warm & White brand is a blend of mostly cotton and a very small amount of polyester batting, which is very thin; but it "breathes" no matter what season you use your quilt. Most of my customers like the idea of choosing fabrics here at the studio, as it does simplify things quite a bit. As you have probably heard, the cotton industry is going through some major changes at this time. If my suppliers adjust their prices the next time I place an order, I will update the information here as well. 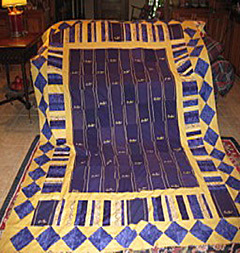 This quilt was created to fit either a queen-size bed all the way to the floor or a king-size bed with a bed skirt. 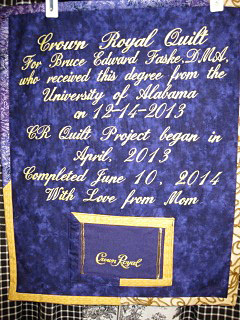 This project, which took me 14 months to complete (in between other orders), involved cutting apart 42 crown royal bags to create half embroidered bag panels and half "plain" panels. I fused interfacing to the back sides of the panels to give them more body during the piecing process. 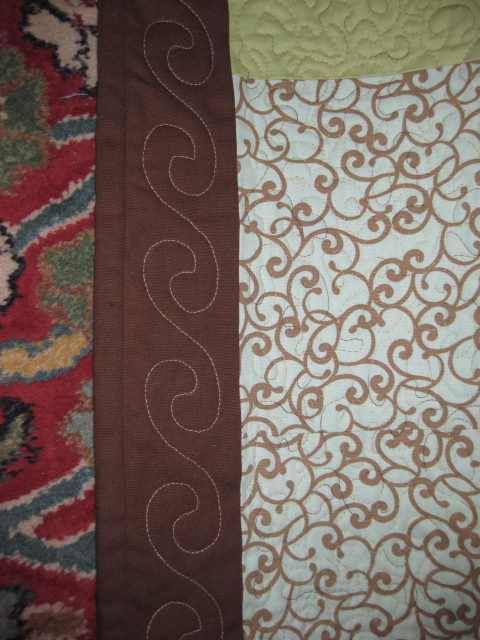 I then had to resize these bags for the center panel. 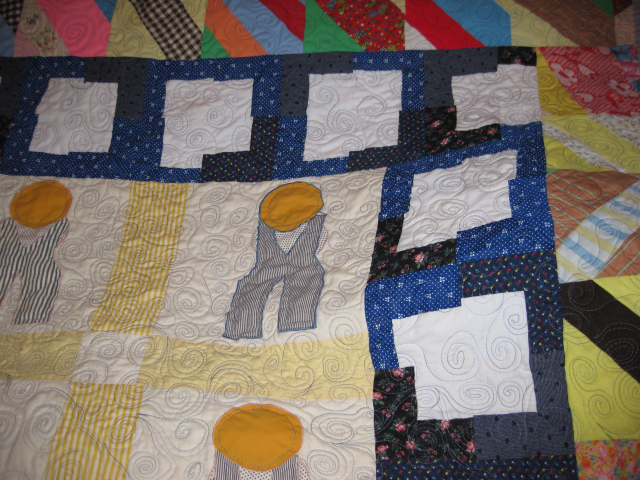 I would like to mention that a quilt project of this magnitude requires about three times the work involved, when compared to a typical T-shirt Quilt. 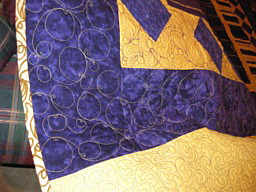 Planning the five borders to frame the center took me over two weeks to complete the layout. 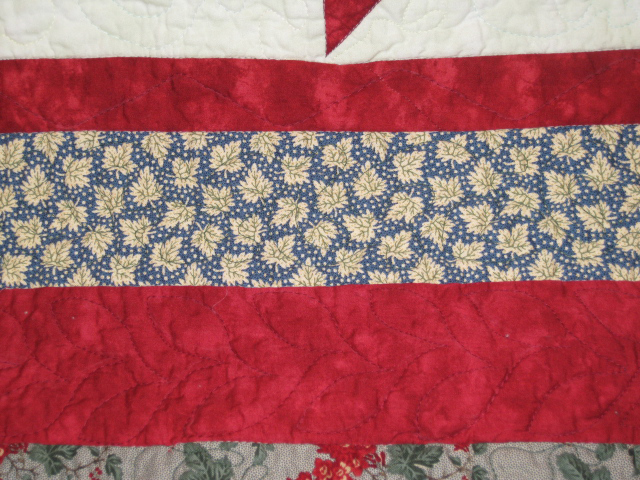 I ditch-quilted each border to guarantee no shifting of layers during the quilting process. 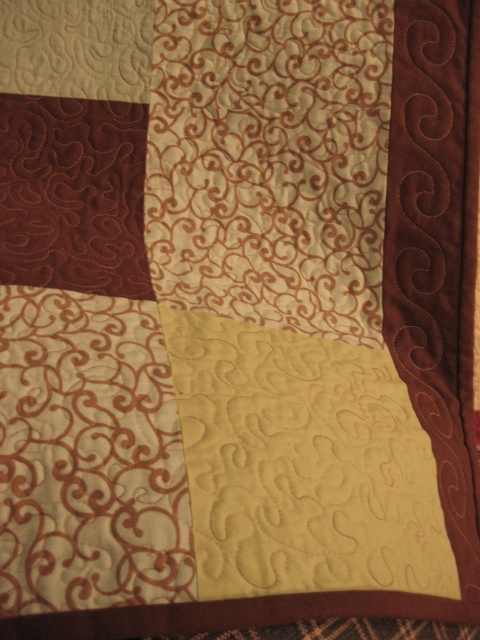 The entire quilt design itself is free-motion quilted (no stencil markings whatsoever). 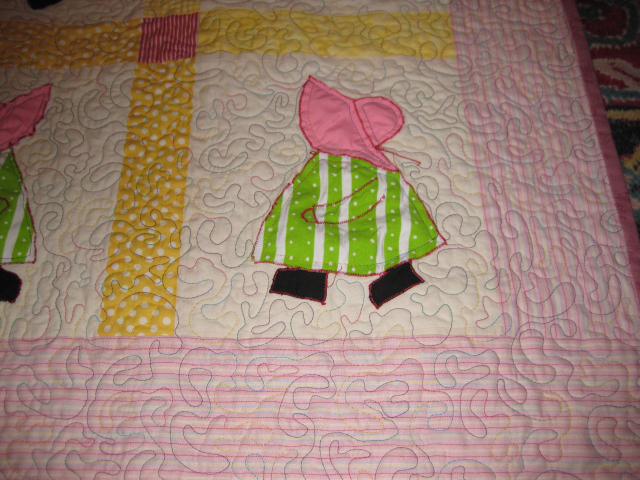 This means i dropped the feed dogs and moved the quilt to accomplish these different quilt designs throughout the top. 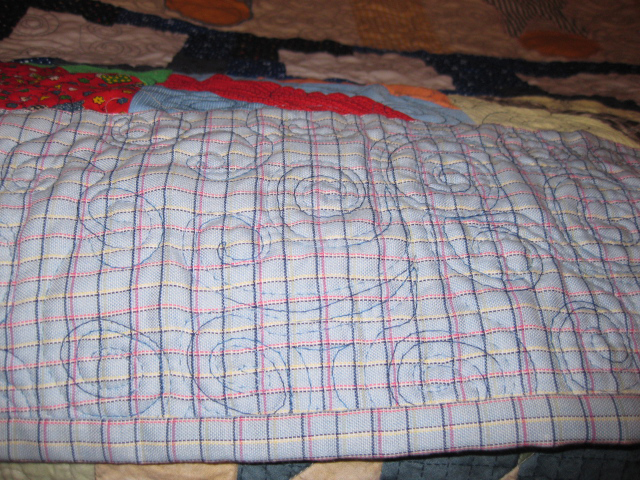 I created a scrappy binding to cover all quilt edges as well as the custom label edges on the reverse side. I digitized a custom label for the reverse side, using one of the smaller crown royal bags as an extra detail. 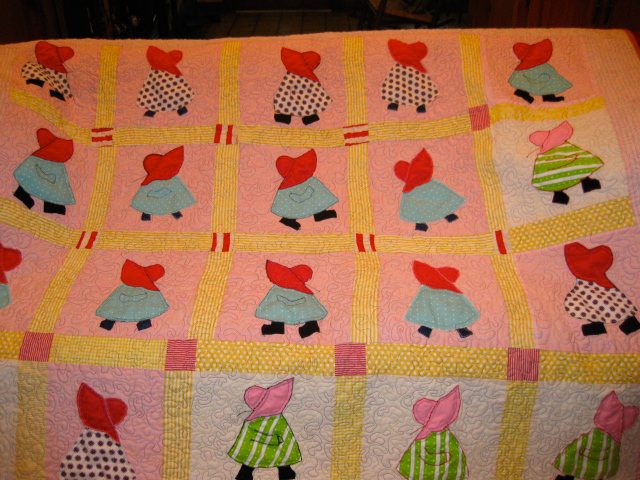 Labor alone for this over-sized quilt is estimated between $1,200 and $1,500. 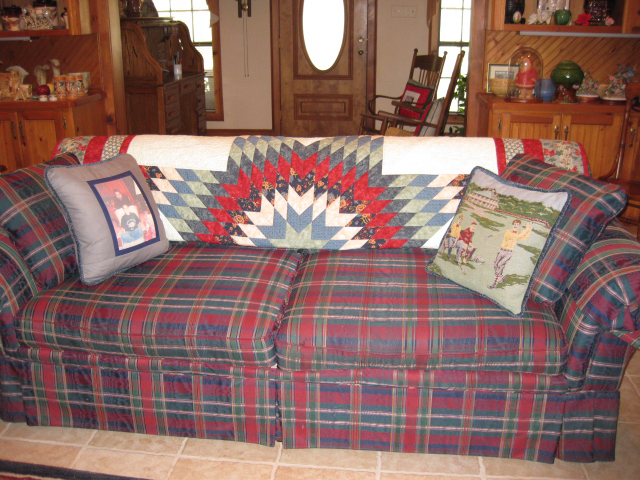 Adding materials (batting, thread, backing & border fabrics) will average $375-$400. 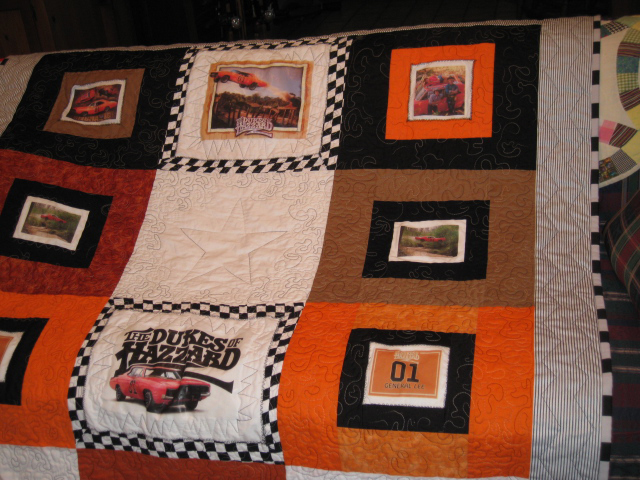 If you are interested in ordering this type of quilt, you will need to give me a 9 to 12 month advance notice so I can give your project plenty of time. As the label states, I began this project in April, 2013 and completed it on June 10, 2014. 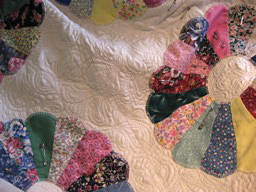 My client pieced all 36 Dresden Plates for this project. I applied Fusi-Knit brand interfacing to the reverse sides of the "plates", to give each some stability before I machine-appliqued them to the 15-1/2" muslin squares. 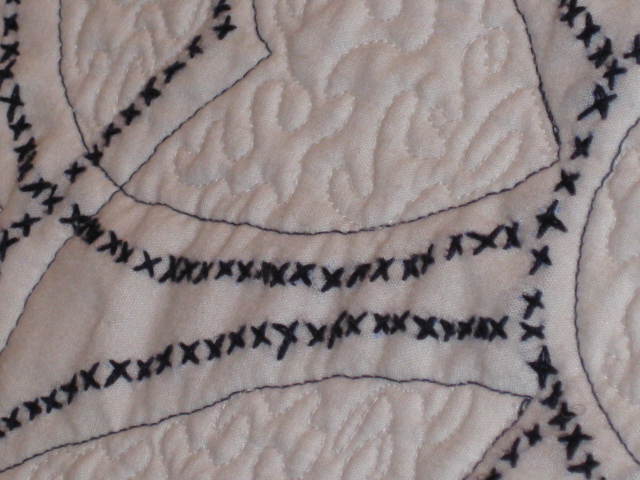 The only straight-stitch "Ditch quilting" I did to this quilt was at the square seams. 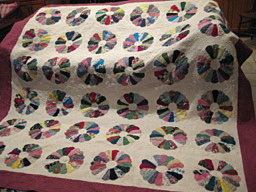 This entire quilt was free-motion quilted, which means there were no stencil markings to quilt as guides; free-motion quilting involves the quilter controlling the fabric in such a manner as to create the design merely by moving the quilt. I used approximately 7,000 yards of thread in this project. 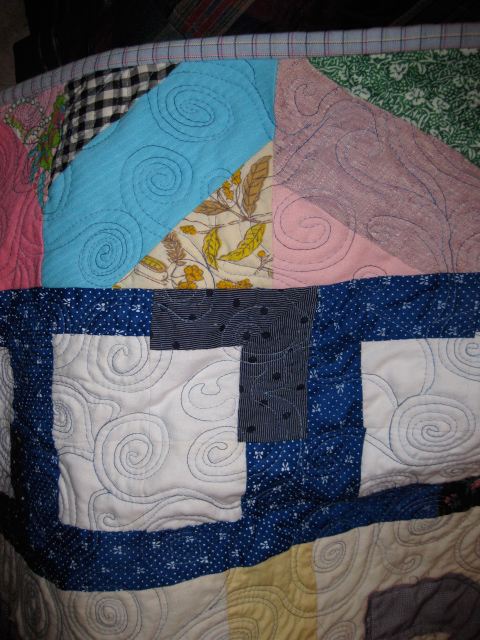 This quilt was truly a labor of love! It was completed on April 7, 2014. The client was very pleased with the outcome. 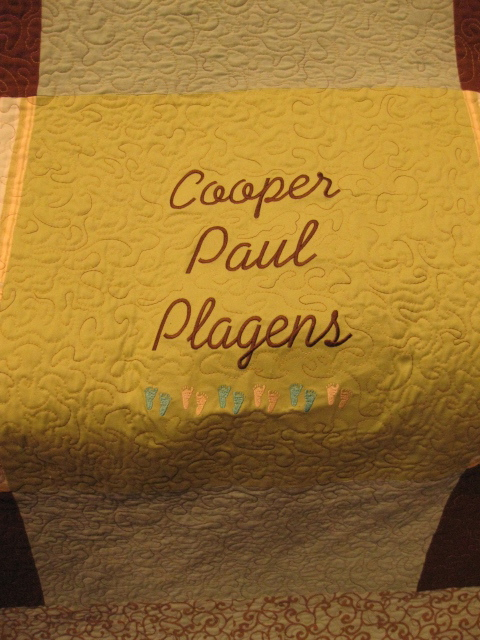 I was honored to create a newborn's custom quilt, which features the baby's name in large embroidered letters for the center of the quilt top. 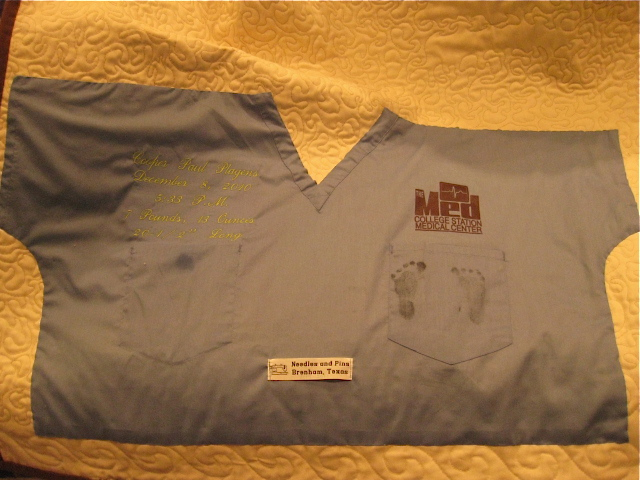 I added the footprints beneath the name, because, as you can see on the reverse side, the scrubs top, which the baby's father wore when he was born, also includes the baby's footprints. 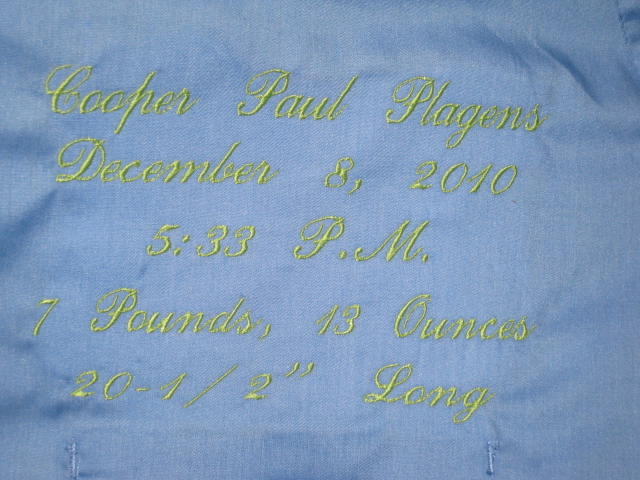 I embroidered the baby's name, birth date, weight, height, etc. on the other side of the scrubs top. 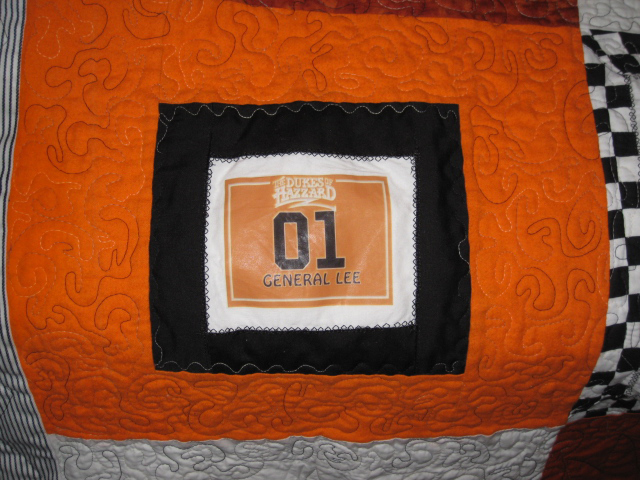 This way, I was able to incorporate the scrubs top as the quilt label itself. 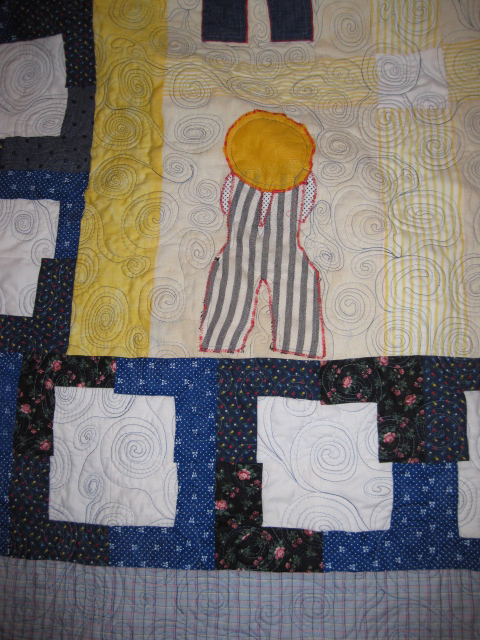 The quilt was featured at the newborn's baptism in January 2011. 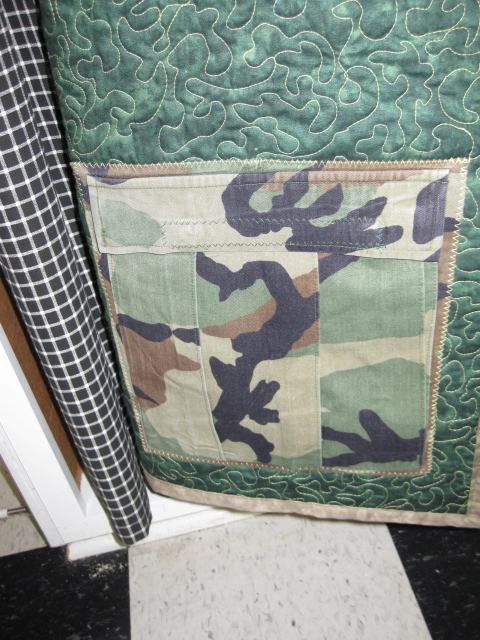 I was asked to create three children's camo quilts, which were made from their uncle's two military-issued camo suits. 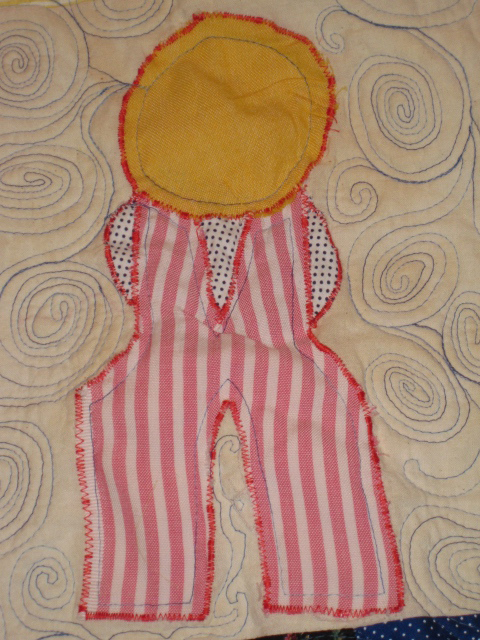 I cut up the suits, added some additional fabrics from my inventory, and I even added the patch pocket to the back side of each of the 3 quilts. 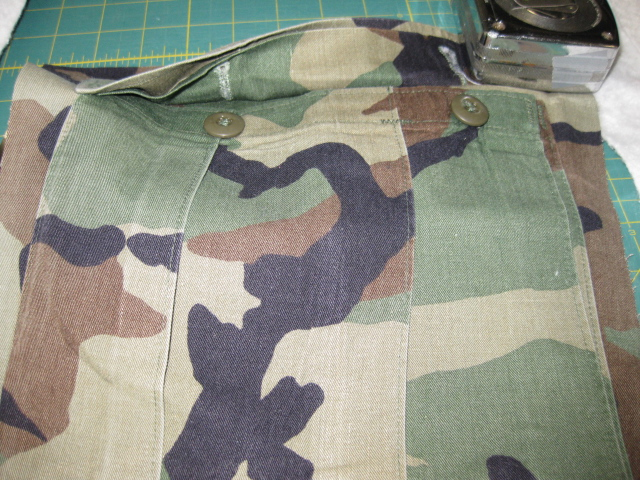 I removed the buttons from each large pocket and replaced the closure with velcro. Each nephew and niece will be able to put their keepsakes in the pocket. 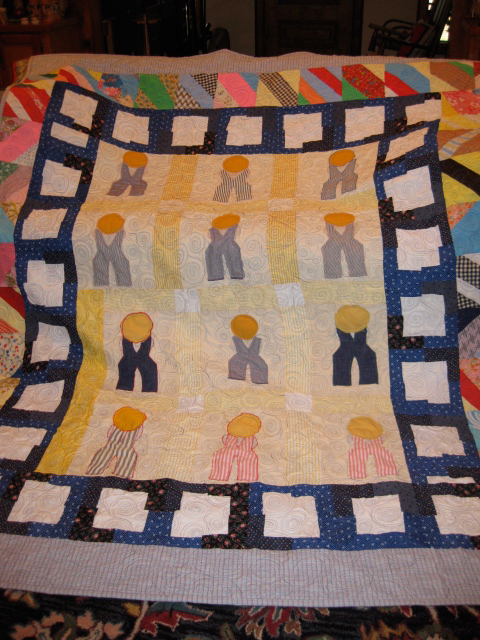 My client requested I add the loop at the top corner, so each child would be able to grab their quilt off of the wall peg. 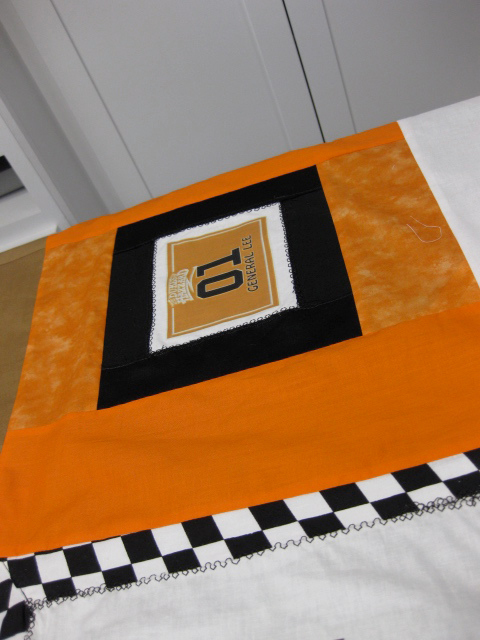 I placed fabrics in an improvised checkerboard pattern; each measures 10-inches. 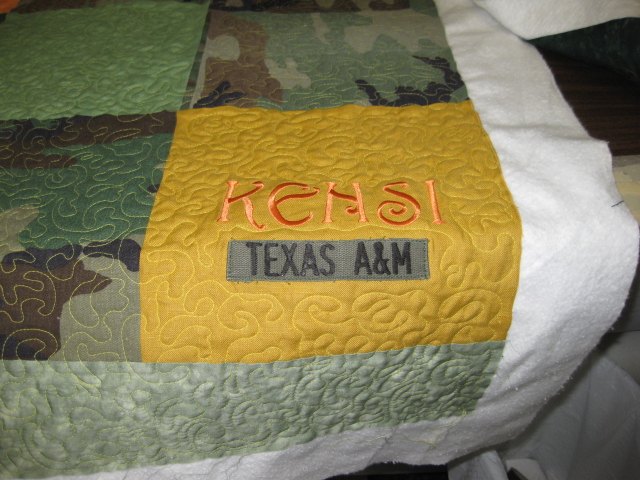 The uniform's labels were also sewn on the embroidered name squares. 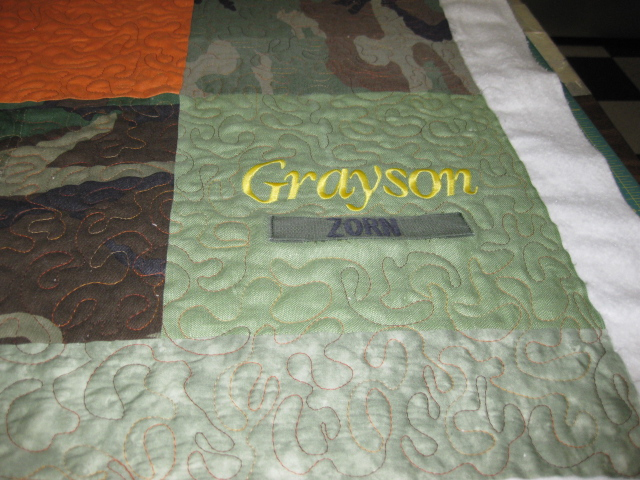 I embroidered each grandchild's name on the corner squares, to give it a personal touch. 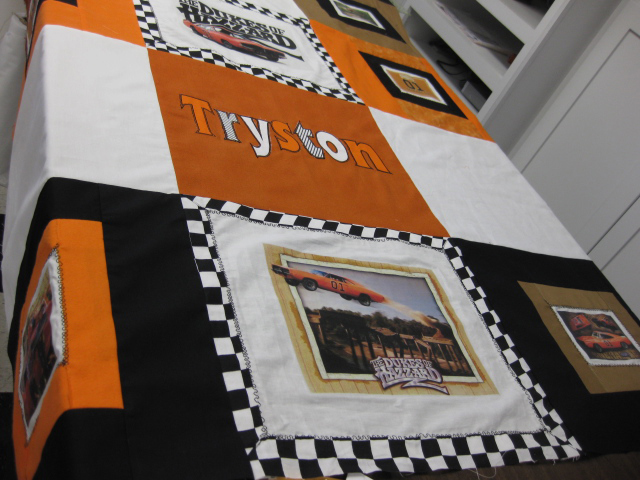 These are truly keepsake quilts! 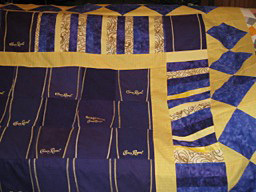 The "Twisted Sisters" quilt, shown below, fits a queen-size bed. It was finished in April, 2010. 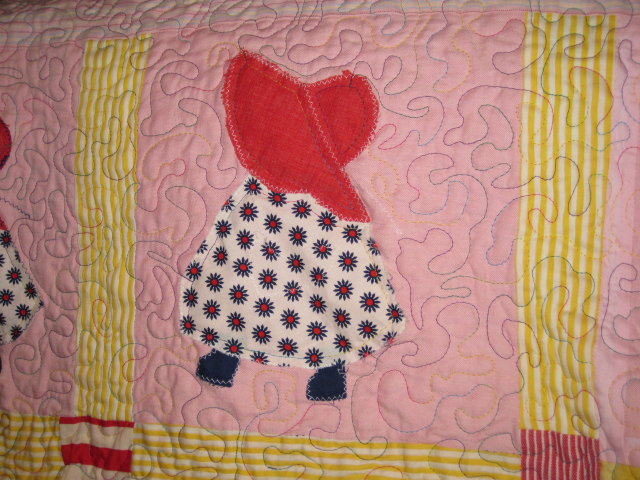 Reproduction fabrics were used for the quilt top, binding and backing. 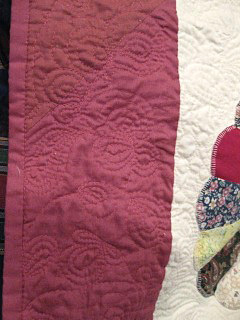 An overall meandering stitch was quilted on the quilt top; a butterfly design was used in the wide borders. 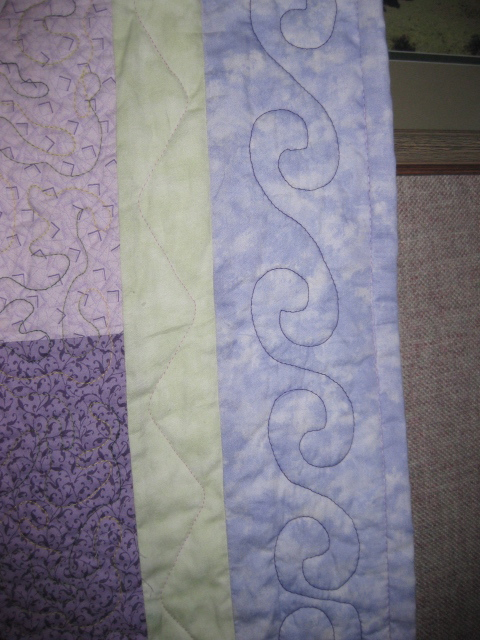 Below are close ups of the border, individual square and a general view of the quilt top. 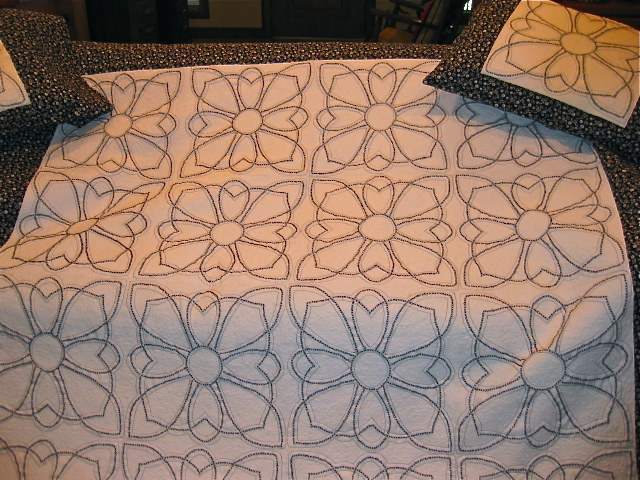 Matching pillow cases were also made to be used with the bed quilt. 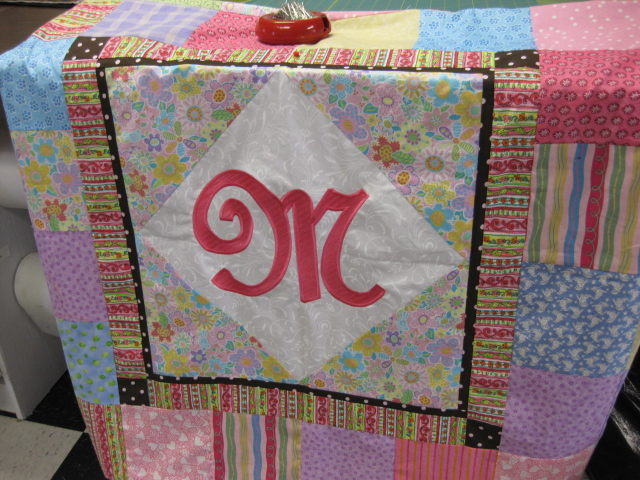 This is what I call the "M" Quilt. 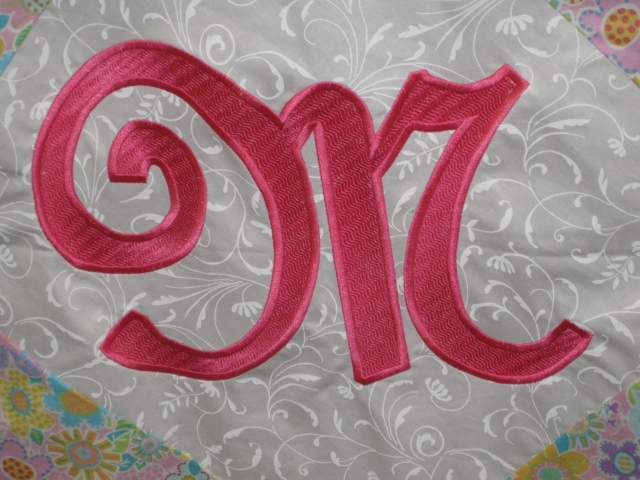 The customer had cut out the center diamond and wanted the largest "M" I could digitize for the center. 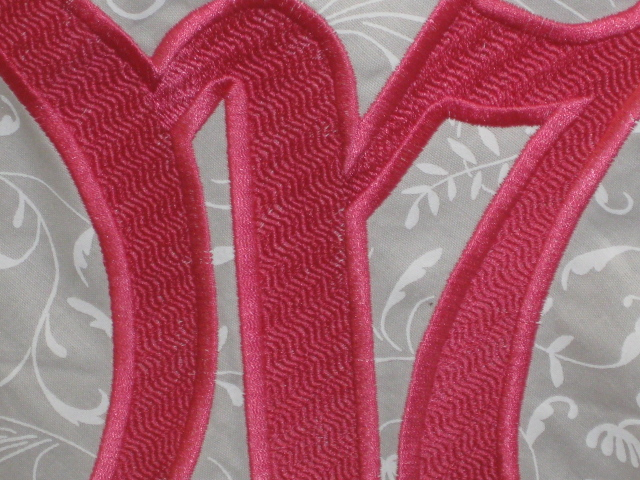 The "M" ended up being 8-inches wide by 12-inches tall. This was one of my most challenging requests. The digitizing didn't take that long to accomplish, but the stitch out took approximately 4-1/2 hours and 225,000 stitches! 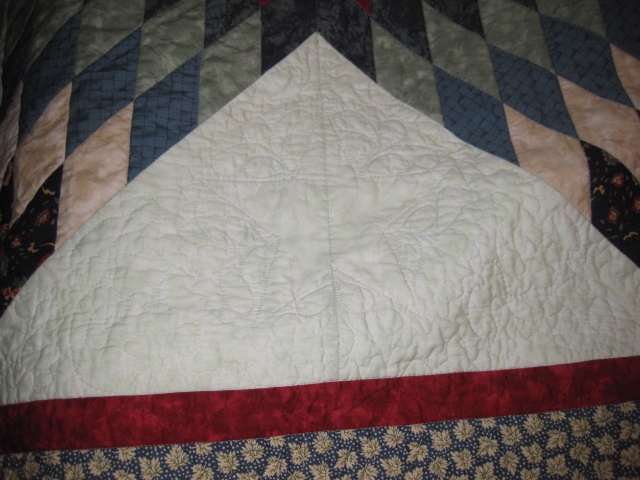 The customer then took the stitched center diamond and finished piecing the quilt. 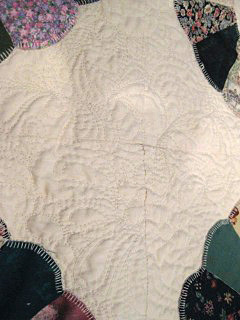 I have photos showing both the center and the finished quilt. 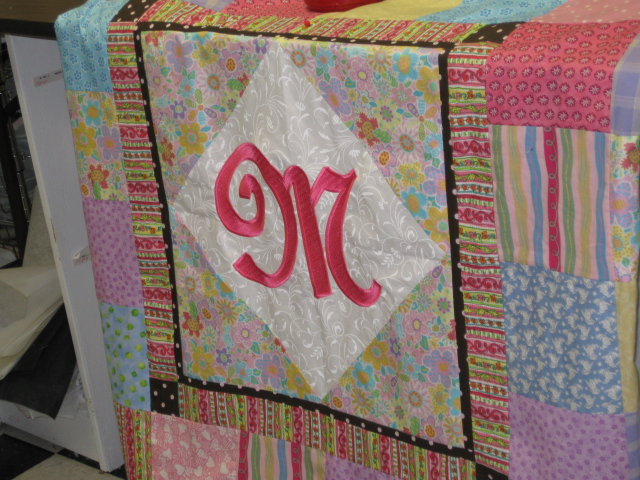 The my client's granddaughter was thrilled to receive her quilt! 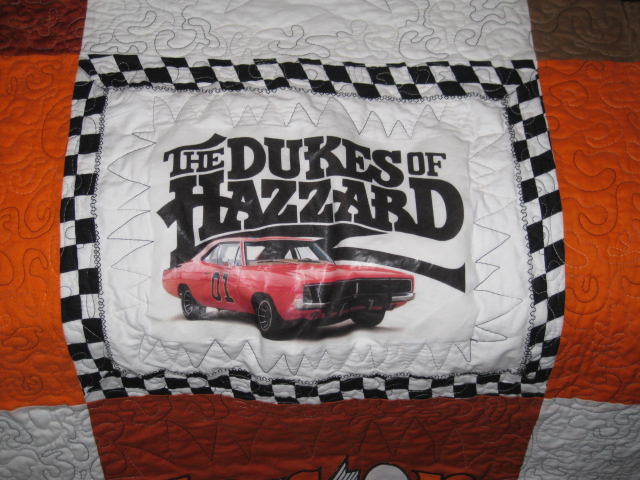 This "Dukes of Hazzard" quilt, which is fashioned after the classic TV show, features alternating printed squares which the grandmother purchased from Ebay, along with "plain" quilted squares. 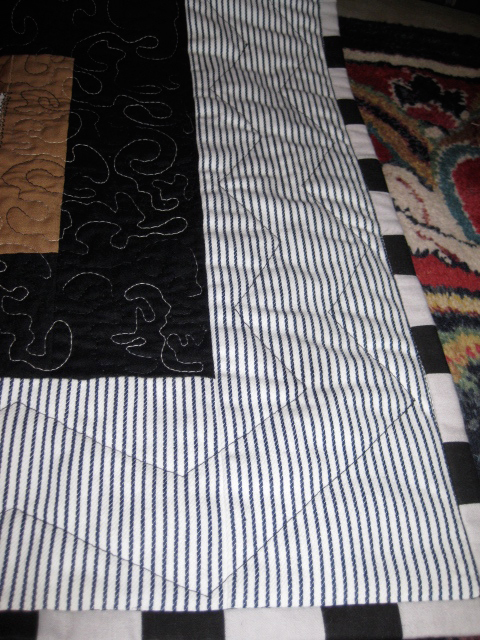 I used variegated black, white and gray thread in the main quilt top along with solid black thread for the borders. 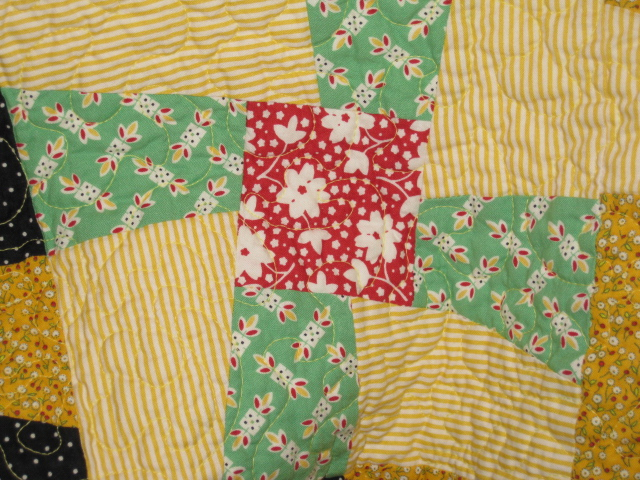 I enlarged the original squares with fabric and added the star with overall quilting. 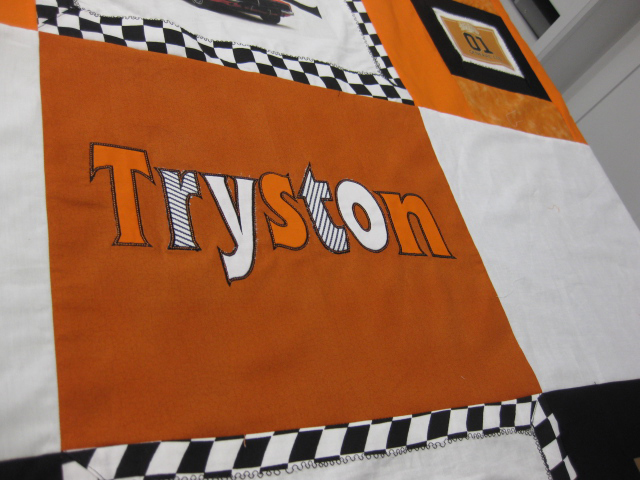 I digitized Tryston's name into applique letters and applied all of them with my embroidery machine. 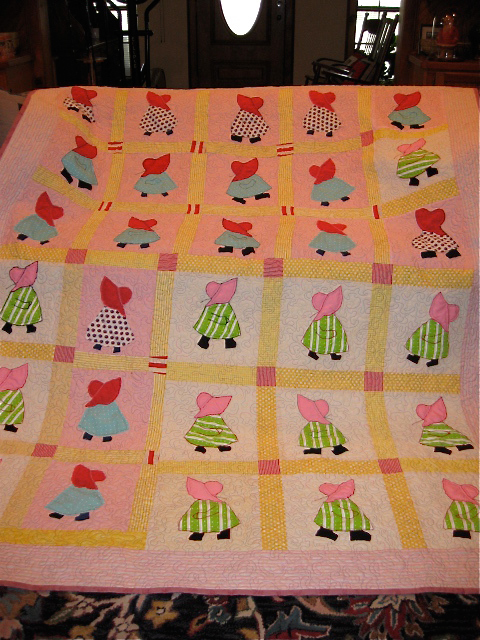 I used narrow striped mattress ticking for the outer borders and quilted a "Car Tracks" zigzag design around the outer quilt edges. 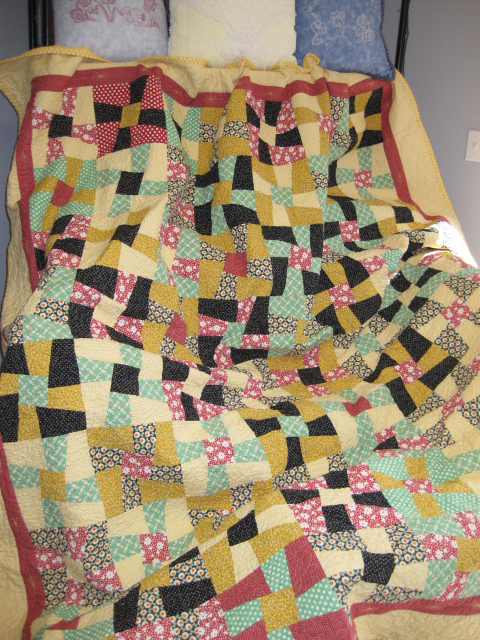 The solid black binding frames the quilt. 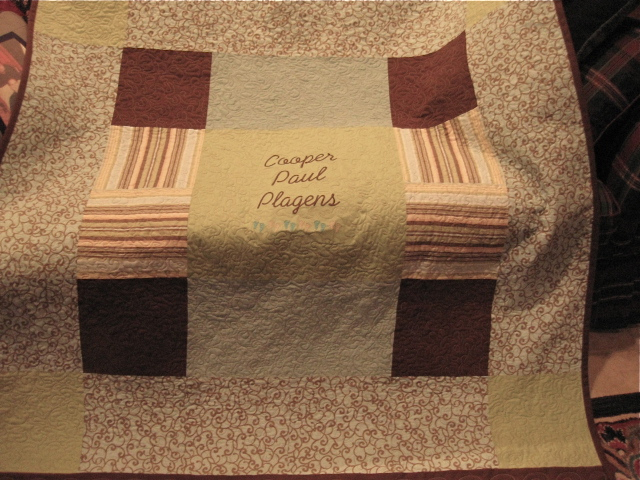 This quilt features colors from our family room. This is the first quilt I have made for our personal residence in the past five years; so I felt I had something to "show for my time" in between orders. 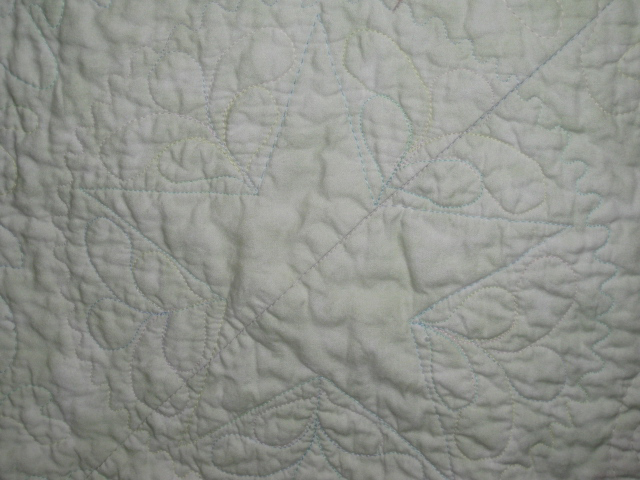 As you can see from the close up photos, I included a smaller Texas Star in the light green background fabric. 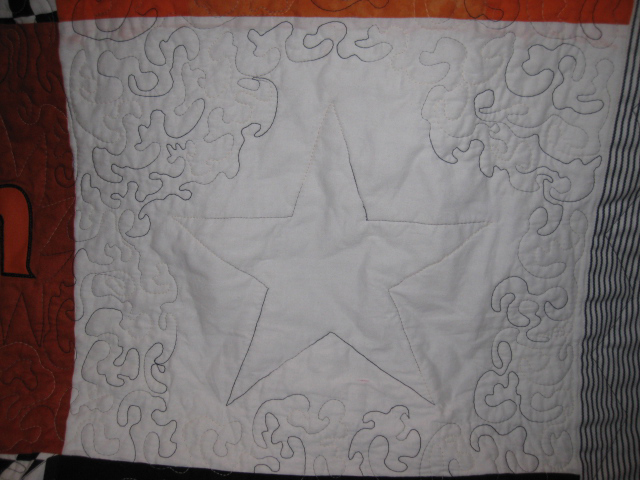 I added several outer borders to the design which framed the star. 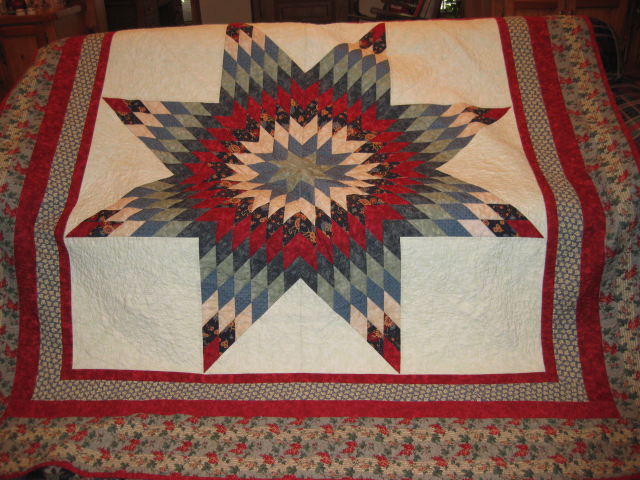 NOTE: This is NOT a commissioned order; however, I thought you would be interested in seeing a different type of quilt (and, yes, red is one of my favorite colors!). 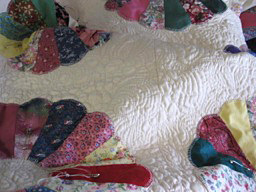 A Houston-area customer came to me in 2011 with vintage quilt pieces totaling six different quilts. 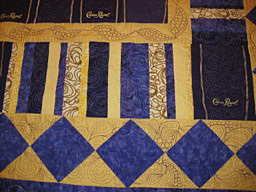 I was commissioned to create finished quilts with each of them. These had been pieced by several relatives in his family, over 50 years ago. 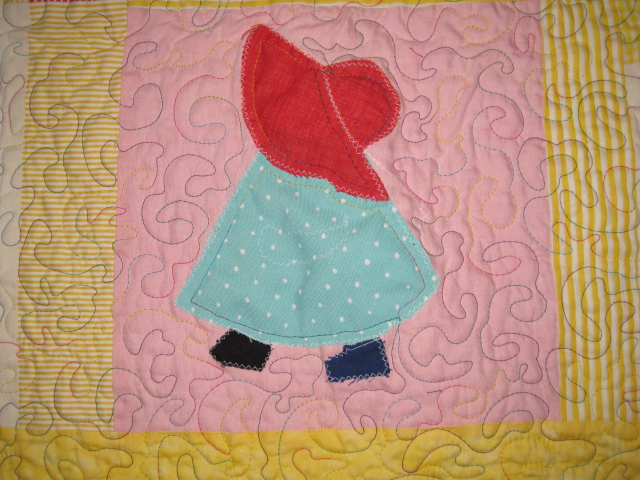 Sunbonnet Sue combined several different fabrics and colors for this quilt top. 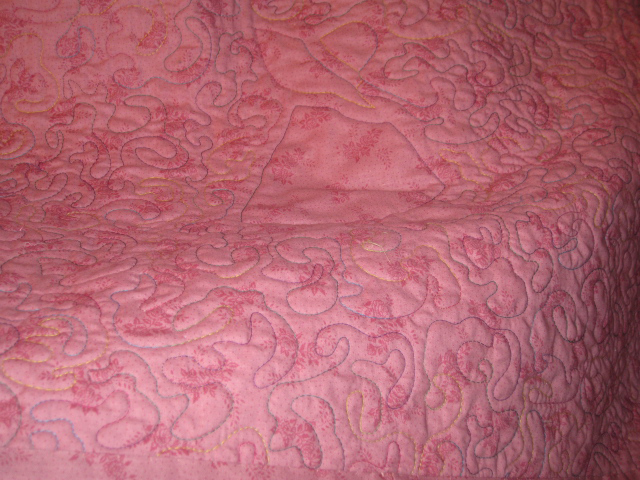 I used several free-motion quilt designs on the top as well. 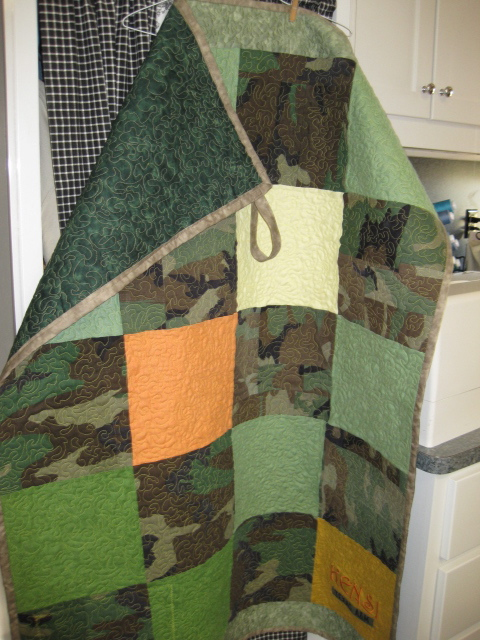 Farmer Fred combined four different squares for the quilt top. I used lots of swirly designs with variegated thread on this top.